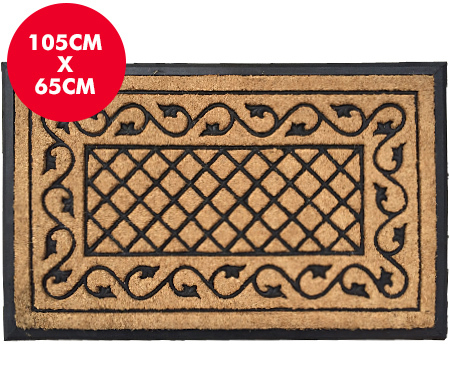 This substantial doormat has a striking diamond pattern surrounded by an ivy border created from plain coir and rubber. Edged and backed in recycled black rubber for longlasting durability. Measuring 105cm long by 65cm wide, this door mat is ideal for those larger entranceways or porches. Our coir door mats are thick and, made from natural coco fibres, have excellent scraping properties. Tough, durable and well-made, these doormats will add the perfect decor touch to your entrance while also being superbly practical.